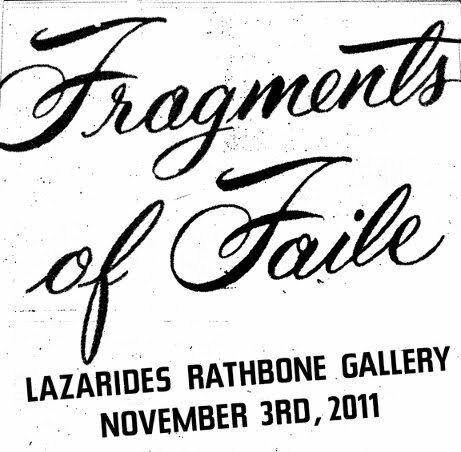 Lazarides Gallery presents FAILEʼs all-new exhibition, Fragments of FAILE, the widely popular US artistsʼ first UK solo show in three years. Whilst the show, running from 4 November until 3 December, will still please FAILEʼs many fans it strikes out in a sophisticated new direction. This suite of new works provides an intimate counterpart to FAILEʼs recent large-scale explorations of religious motifs while drawing out less obvious threads in their practice, from subtle gradations of colour and pattern to a conscious removal of clear identities in order to explore archetypical structures beneath. These choices are underscored by a formal approach that draws on quilting tradition —building something new and vital from otherwise discarded or overlooked materials. Such compositional “quilting” is complemented by eight new pieces “stitched” together from rough-hewn objects—wood blocks, copper printing plates, t-shirt fragments—that extend FAILEʼs use of puzzle boxes, and obscure the boundary between fine and folk art. That all of these materials, visual and concrete, are assembled from FAILEʼs own archive means that Fragments of FAILE represents not a radical departure, but a rare opportunity to see their iconic practice anew.